Testing the tubliss install - DAMN Riders - No rules, Just ride! 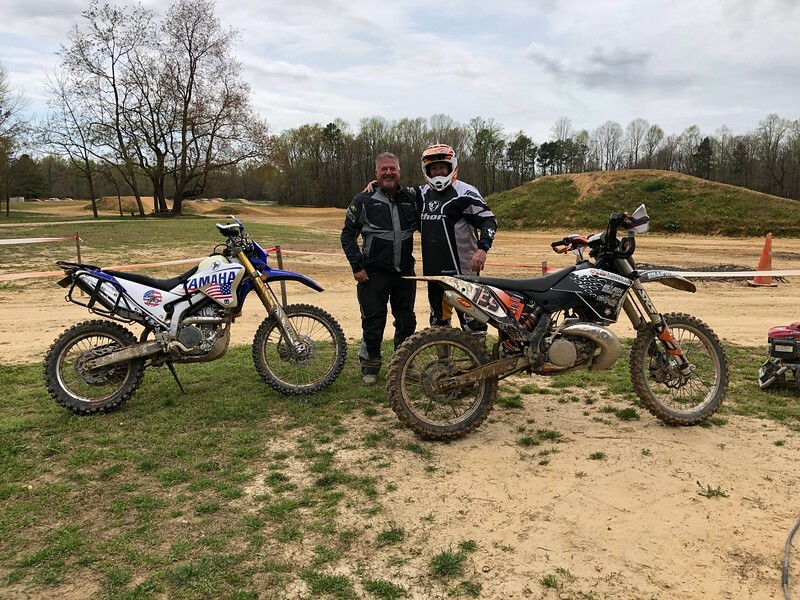 I loaded the 250 up in the truck and went off down to the Wicomico Motorsports Park in southern Maryland to met up with a few friends that brought late model 250cc MX bikes. I rode the tracks there but that’s really not my jam so I talked the insanely loud two-stroke guys into doing some trail ride loops in the woods. It was a moderately easy trail with challenging (to me) gnarly stuff coming up every few minutes - steep rutty slopes, some deep mud bogs, and some narrow navigation to avoid things that would have eaten me and the bike. So with that image in mind, I’d have to say that the tubliss set up is working pretty well. For one thing, they’re holding air after a few rides so what was described as a tricky install wasn’t so bad. And with the tires aired down it made me look like a much better rider than I am. Nothing seemed too much for my traction front of rear. Once I got used to the fact that the tires had a lot of bite, it gave me a more confidence when I had to tip toe around some obstacles or dive off into the muddier tracks. I’m not sure this system is appropriate for an ADV bike that’ll be ridden a lot on the pavement. It doesn’t make much sense to air the tires down for a tricky section then get off, get out the compressor, pump up the tires, stow the compressor, …. And I don’t think I’d want to ride on the pavement at any lower pressure than in the 20’s psi - same tires, same pressures as we ran on the TAT. So I guess the only real benefit would be fixing a flat with a tire plug - which is not small advantage. I’m kinda smitten with this 250. I put a 50T rear sprocket on it (up from 43) and this thing rips on the big hill climbs. While there I also got a chance to ride a late model KTM 250SX motocross bike that had extensive performance work. That thing scared the beejebus out of me. It’s just kind of bogging and mis-firing and protesting then with a microscopic additional turn of the throttle I’m getting my arms stretched and my eyeballs flattened. The first time I stepped on it I thought I’d looped it. I don't know how you ride something like that but I tried just keeping the throttle open and modulating the clutch and that seemed to work though probably not that good for the clutch. I gave it back to my buddy and said “I don’t know how you ride that thing in the woods.” On the track it was a huge adrenalin rush but in the woods I don’t think I could have ridden it at all - so I didn’t even try. I fear that much power would be a bad thing for me and I'd end up getting plastered right into the side of a tree - Wile E. Coyote style. MX bikes are designed for ripping it up on MX tracks. I do not like using them as trail bikes. However, plenty of guys do use them for trail riding. The faster and more aggressive you are the better they work. Ive ridden multi day dualsport trips with my tires at about 14-15 lbs. This worked well for me. Including 70+ on pavement. It seems like I should be worried about heat building up in the tires on the road at inflations below, well, I'm not sure. Intuitively I'd say about 20 psi, maybe more if I'm loaded with panniers and camping gear. I'm going to start experimenting with different pressures on running around town to see what feels right on the pavement but I'm not sure how to evaluate the heat that might be building up. I'm also wondering if there's a pressure in the void between the tubliss and tire that could be high enough to start escaping through the rim/tire bead contact point given that these are tube type tires and rims. Running pressures in the high 20's may be a futile thing. Im generally running a bike with minimal luggage. But my DR650 is quite bit heavier than your WR. Im sure my tires are wearing out faster running 14-15 but its not a big deal to me. Yes, getting on/off bike to inflate/deflate tires sounds tiring. However, starting the day with 20+ for those days you know will be mostly road and dirt roads sounds reasonable. Maybe dropping down to 14 for the days you know will be more dirt and/or actual offroad stuff. Do what you feel best of course. But riding around on the street with lower pressures really isnt that big of a deal. Good to know guys. Thanks for the insights.